I find myself pondering lately the fluidity of all things. The great unending change that is all of reality. They say that the only constant thing is change, and I believe it's time that we forest-lovers, naturalists, hunters, foragers, hikers and outdoorsmen embrace this change. Think back to your childhood, really think back. Is the house you lived in the same? Is the landscape surrounding your house the same? Are you the same? Are you changed? What things do you notice? It is questions like this that has me really pondering much of how we look at our ecosystems and our landscapes. Nature is NOT stagnant. No matter what the Native Plant Zealots(or NPZ's for short) try and tell you. There is no constant and ever present ecosystem that hasn't changed since the beginning of our world. Hell, I'd venture to say that there are no ecosystems that have remained constant for one hundred years. Today as I walked through the forest looking for chaga mushrooms(Inonotus obliquus) I was indeed facing the very thing that I am talking about. I was in a forest that was growing up, and slowly but surely darkening. If you know nothing about Birch trees let me tell you one important factor in their growth:Birch trees are pioneering trees that love a lot of sunlight. Chaga grows on Birch trees, and so I went to place I knew had some Birch present. However to my great surprise I found tons of dead and dying Birch, not one Chaga, and almost no young Birch. Now, I know that what I was looking at was Forest Succession. The forest there was maturing. The pioneering Birch was being replaced by the longer living Beech and Hemlock trees that were taking its place in the sun starved forest. It may indeed seem alarming to see so few healthy Birches, but it is in fact a perfectly normal and healthy thing to have happen: Change. This is where the NPZ's and I cannot agree. They see nature as a stagnant unchanging place. Imagine if you had a picture of what the world looked like on the day that the Europeans set foot on this continent. That is what they are working to make this place we inhabit look like. Nevermind that even if Europeans had never reached these shores, the continents flora and fauna would most certainly have been drastically different from how it was 500 years ago. Even with no globalization plant communities spread, shift regions, ebb and flow, and even go extinct all without the help of humans. To be certain, we are helping things change at a fast pace. We are causing species to spread faster than before. But the underlying assumption of many NPZ's is that humans are not natural. But the fact is, that even if you disagree on which way we are going, how things are being done, and why things are being done the way that they are, we in fact are 100% natural. We belong in this world. 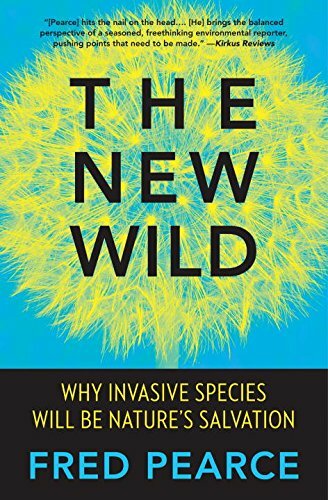 The underlying assumption behind many arguments against the spread of species worldwide is really that humans are unnatural and thus the plants that come along with us are unnatural as well. Nothing could be further from the truth. I live in Northern Michigan, and just a short while back(in the grand scheme of things) this land was covered by over a mile of ice. That's not one tree, shrub, herb, mushroom, lichen or fern. Not a one. So my question is always this: What is native to this area? Who got to decide that what we call native, is native? Was it a committee? Was it one person? Was there a vote? Did we get to ask the plants? Did we get to ask the animals? These all may seem absurd, but it is my opinion that it is equally absurd to declare anything pre-Columbus as native and anything post-Columbus as non-native (never you mind of course how we could possibly know such things). Change is an inevitability, and to act as if we can preserve the approved list of plants in perpetuity is extremely naive and in my opinion a dangerous myth to spread to our children. I admire with all my heart all of my friends that I have met along the way that are fighting back against what they view as the enemy, I truly do admire their passion, but it is this very mindset that will hold us all back in the greater fight against climate change. We as a species are so fortunate in our ability to adapt and change and live in wildly different ecosystems. We didn't expand to encompass the entire world because we are afraid of change. It is those of us that harness our innate ability to thrive in changing ecosystems that will be the leaders of our new and warmer world. Perhaps one of the most important steps you could possibly take in the coming season would be to evaluate how Garlic Mustard or Autumn Olive or Wild Parsnips might actually be a positive and not a negative. Perhaps you may go out and sit among these "invaders" and turn off your cellphone and just sit in deep thought about why you fight them with such fervor. Perhaps you will realize as all of our ancestors realized at one point, that fighting nature is impossible, and that it is much easier to go with the flow and take the gifts that the gods offer to us. You cannot stop change. Ever. Nature is not now, nor will it ever be stagnant, and I think that it's about time that we stop teaching people that it is. There is deep beauty in the ever changing world we live in. This book down here is pretty darn good! Challenge your ingrained thoughts!